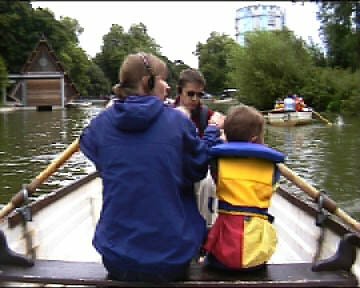 Boating for Beginners was an off-shore audio guide. 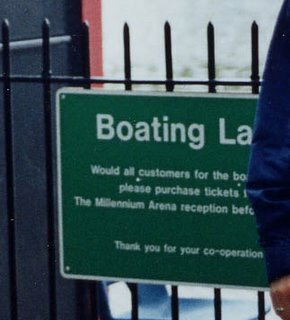 Anyone hiring a boat on the lake in Battersea Park during the summer of 2002 could take a Walkman with them with the specially prepared 15 minutes tape. The recording is very much a spoof on those guides one gets in historic and cultural buildings. The narration read by the Rev Alan Dupuy mixes some fact with much fancy, and treated sound recordings made in and around the park. This was the second of three pieces with a rowing theme. The first was called If O became E which was part of the group show Gym at the Conductors Hallway, the third piece a video entitled Row Row made this year and is a 'workout' of a picture of the Rev Dupuy out on the lake during 2002.